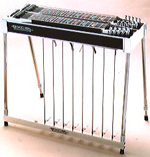 Fuzzy EXCEL/Superb is a pedal steel guitar 100% made in Japan. This guitar features a tuning stability second to none. These pedal steel guitars have been meticulously crafted to the highest standards ensuring you'll sound your best when it counts. This guitar represents the culmination of years of experience in both development and crafting guitars. 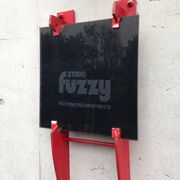 Fuzzy Pedal Steel Guitars have garnered immense praise from professional players who use our products for live performances and studio recordings. Now available for yours. Contact us to buy now. Choose your favorite model and color combination. What we introduce at this time is ​the custom order, ​Superb D 10/12 using quilted maples. The customer brought in the lumber, requested the color and specifications. The top panel was painted mahogany color, it turned out gorgeous like a lemon dropped sunburst LP std! The special thing is that does not only look cool but also the lightweight 10 strings and the 12 string double neck, plus the pedals and the knee levers are set with high precision. We do not usually accept the orders with maple material as a ​standard Superb but we customize to your desired specifications like this one as much as we can. Just feel free to contact us about your desired specifications. We are Introducing the custom order, 6 strings lap steel guitar. The characteristic of this guitar is that the front legs and the rear legs are height adjustable. You can play by standing if you extend the legs. 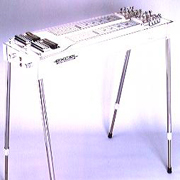 you can use the knee lever when sitting and playing, you can also play like a PEDAL steel. 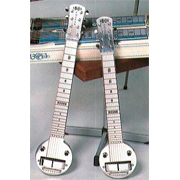 Although the 6-string lap steel is the simplest structure among steel guitars, it has been popular instrument by using various tunings for Hawaiian, Western swing, etc. since long time ago. Recently it is often used in overdrive sounds as rock and blues, also it has been played by standing up on live stages more often than before. We can customize to your desired specifications. We have designed customized steel from overseas. This model is the basic specifications of E9th (3 pedals and 4 knee levers) without volume tone control or lock lever as any other options. It is a simple basic single neck but you can see many years of experienced skills, high quality and innovative ideas everywhere in this model. We highly recommend this model for the players who would like to start the pedal steel and of course for the experienced players as well. Also, it is very popular model for the players who have the standard instruments already like E mmons or Sho‐Bud. 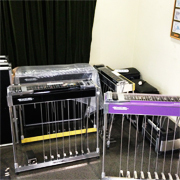 That is because it is very lightweight and easy to carry for live performances. And it is possible to install floor pedals or knee levers and to change to the 10‐string universal tuning in the future. You can enjoy this instrument for many many years. Lightness is one of our greatest features as you can see in all our products. We have succeeded in having amazing sound and lightweight without sacrificing qualities of the pedal steel such as resonance and sustain. Look at this new color for the S​uperb S12. It is two‐tone color with purple (side panel) and black (top panel) as requested by the customer. The metallic purple color expresses dark blue from black then to purple by the lighting position, angle or in the degree of light. It certainly shines brightly on the stage. It is very popular to select two different colors: one for the top and the other for the side body as a two‐tone color, like the picture. Please feel free to contact us about the color you would like or any other specifications. Introducing our newest model, Superb S12. We have painted this guitar with white and black two‐tone color that is inspired by the colors of a tuxedo as requested by the customer. The special feature of this model is the lock lever for E9/C6. This lock lever has been upgraded from E9/B6 which is the standard universal 12‐string system. The upper row of black nuts are set to drop the tuning and the lower row are set to tune up. So the 12 strings would be able to raise up and lower both ways. As a result, this makes changing tuning more flexible. You don't need to be stuck in the basic E9 format. Additionally, each string can be fine tuned and can tune more severe. Particularly popular in our line­up is the Super S12 but remember, the biggest feature for this model at this time is the way to change the tuning by the lever. Again, we have upgraded E9/B6. This model has completely achieved the C6 tuning the same as the double neck, not staying in supportive B6. It is a very recommended model for experienced users who are used to using double­neck. Mr. DeWitt Scott, Scotty music, passed away in the morning, September 23, U.S.time. He made an effort for development of the steel guitar world throughout his life and we had his help as our company's distributor in the United States. We would like to offer our deepest sympathy. We painted it in our popular two­tone color with deep metallic green and black. The design structure of the attaching part was redesigned to make it easier to fine adjust the pedal angle. Our new design allows you to remove and install it using one hand. The semi­-hard case is lightweight and convenient too. This case has thick cushion inside that makes it impact resistant just like the hard case. Also included are useful items such as caster or zipper lock. We highly recommend this case to the musicians who need to take the train as transportation or who have lots of live performances. We are introducing a new model, The Superb D9 / 8 in 2015! This new model is a non pedal, double neck lap steel guitar. The front neck which has 9 strings is set up to extended E9th, the rear neck is set up C76. This guitar is made in a two­tone color with deep blue and black. This color scheme gives the guitar a sharp, simple and clean look. Just like all of our pedal steel guitars, this one is lightweight and built to our high quality standards. Please feel free to contact us, and let us know your choice of specifications and tuning. Introducing our newest model. This model has a special knee lever. This new model is able to change the tuning from the E9 to the C6 by using a knee lever instead of changing the tuning from the E9 to the B6 by a hand lever in our standard Superb model. You can change the tuning without releasing your bar or your pick from the strings while you are playing. When changing the tuning back to the E9 from the C6, simply unlock the lever by lightly touching with your right knee. This is an incredible idea so that now you can play using a double neck seamlessly without interrupting your musical phrase. We can manufacture this kind of special model as well. We are always inventing new and exciting steel guitars. 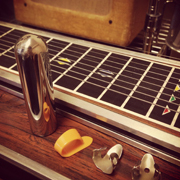 We get ideas by listening to steel guitar musicians around the world. Please feel free to contact us about the tuning you would like or any other specifications. shown: adjust to tune the C6 with the black screws underneath of the nylon tuning nuts. 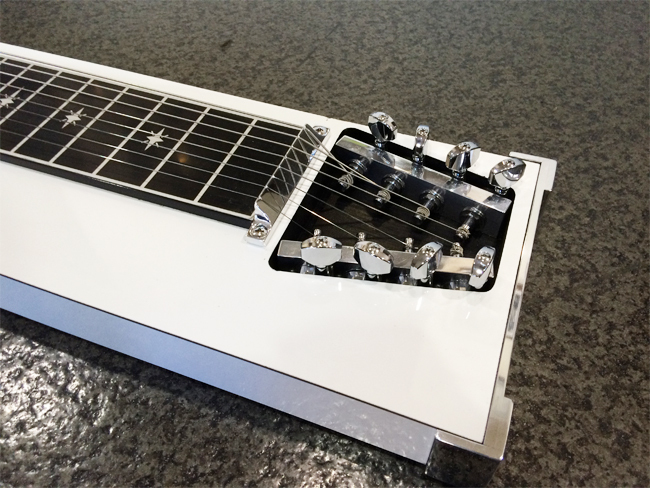 Introducing our newest 2015 model of Superb pedal steel guitar. The newest Superb has been upgraded to prevent cabinet drop from occurring. Cabinet drop is when the body of the guitar flexes under pressure applied to the pedals and detunes a string or strings. A traditional model has one attachment point to connect the pedal stop and the knee lever stop, but the latest model has been structured with two attachment points for the pedal stop and the knee lever stop. Refer to the second picture below for a close-up of these attachment points. This newest model has been redesigned to prevent cabinet drop from occurring in the first place. This model stays in tune like never before. 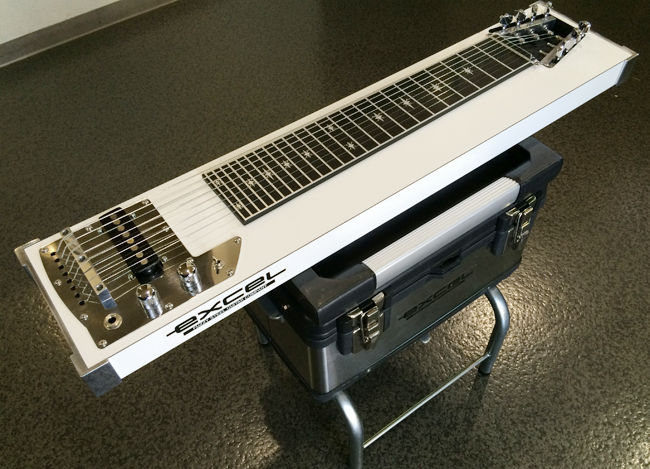 We are now introducing our latest 2015 model, a Lap steel guitar(non pedal). We have manufactured the 8-string lap steel guitar with a wood body. It is made in two-tone color with vivid Olympic White and Black fretboard. The white colored model shown is a custom paint job, as requested by the customer. Besides pedal steel guitars, such as the Superb and Excel, we also produce and sell non-pedal Hawaiian lap steel guitars. Experience a live performance featuring our fabulous Fuzzy pedal steel guitars!